NOTE: THIS ARTICLE HAS BEEN MOVED TO MY ENGLISH BLOG, PLEASE REFER TO THAT FOR THE LATEST UPDATES. 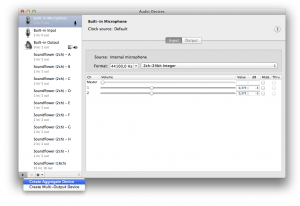 You can rename the audio device if you wish to. I chose the name EasyApple, the name of my podcast. 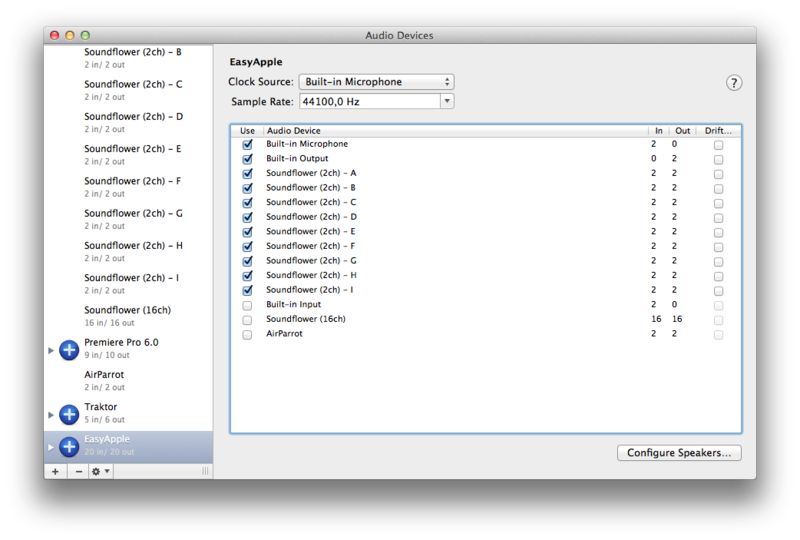 The next step is to select which sound cards will be added to the aggregate device. 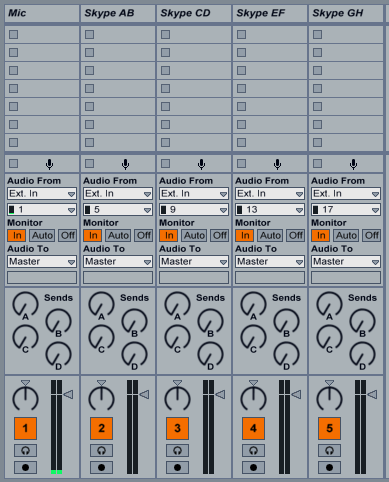 Be careful to follow the right order when you select them, otherwise things could become messy in Ableton Live. 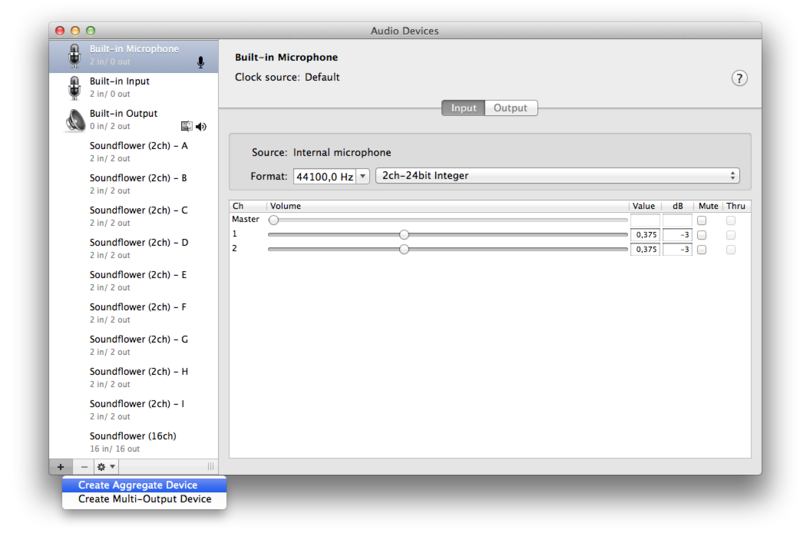 First select your microphone input, your headphones output,Â thenÂ all of your Soundflower sound cards (from A to I, if you used my plist or DMG). Your aggregate device will now have bunch of inputs and outputs, and all of them will be used. It’s a good idea to rename each track: click on the first one, press Command+R and type Mic, as well use this one for our microphone. Do the same for the other tracks, and name them â€Skype AB/CD/EF/GHâ€ or whatever you find appropriate. For example, if you always call the same person with the same Skype instance you might want to name the track after the called person, but that’s totally up to you. The inputs are almost ready, but we also need a few outputs to feed back the audio to Skype. This is done through the so-called Return Tracks, the ones on the right side next to the master. 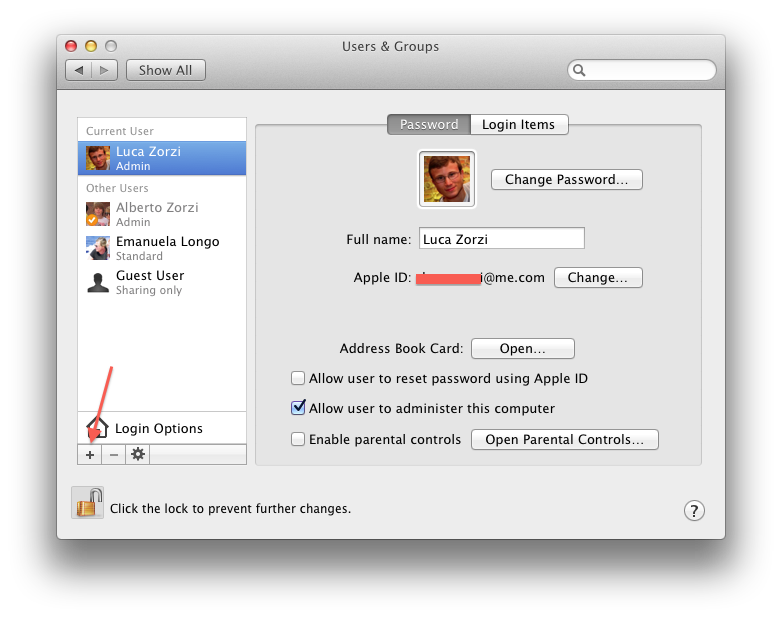 There should already be two of them by default, add more of them by clicking on “Create/Add Return Track” on the menu bar (or press Command+Option+T) and match the number of Skype instances you have running. 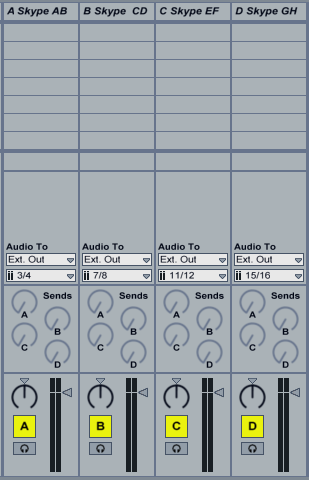 Rename them in the same way you renamed the input tracks. The usual “SkypeÂ AB/CD/EF/GH” will do just fine. 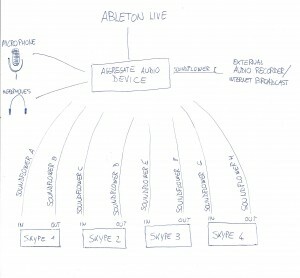 Do the same for the Skype tracks, selecting channels in this order:Â 5, 9, 13, 17. 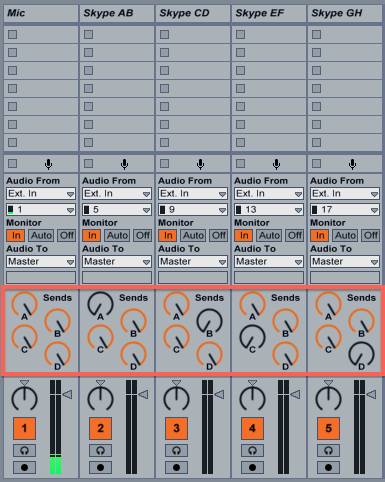 We’re almost done, the only missing part is our headphones: select channel 1/2Â as the cue output (in the master track), then click on the Solo button that is on the left of the Master volume fader, and it will toggle to Cue. Now click while holding the Command key on the little headphone buttons under each input track you wish to listen to while recording. 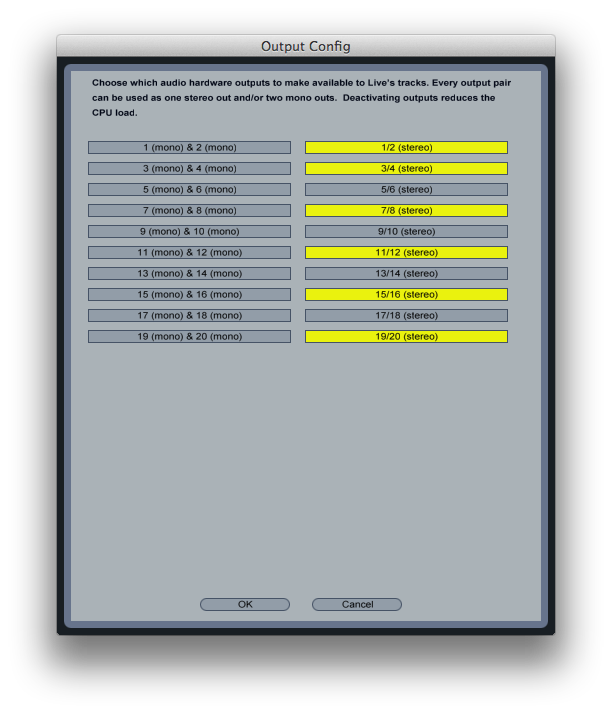 As the master output, select channel 15/16, which is our last Soundflower instance (“Soundflower (2ch) – I”, if you’re using my plist or DMG). You can now use this sound card as the input of every application you need to feed with the complete output of your conversation. I use it to have a backup recording in Audacity, in the unlikelyÂ event that Ableton crashes, and as Nicecast’s input to stream our podcast live. Skype is a great tool, and part of its success is due to its ease of use: it needsÂ pretty much zero configuration. Â Our regular home network environments are not ideal for it, though: we are almost always behind a NAT router, and we cannot connect directly to the person we’re calling, so Skype is forced to route our conversation through a third party (one of their servers, most of the time). While this is fine from a security standpoint (Skype calls are well encrypted), it is not good for latency or potential packet loss. To avoid this unnecessary routing, just forward a port of your choice for each Skype instance you will be running and set it in the Advanced tab of Skype’s preferences. 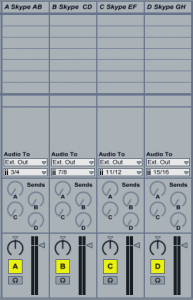 Since we’re already using Ableton Live, why not add some jingles ready to be played as needed? While this is not a necessary step since we’d be editing our podcast afterwards, it could be a good enhancement for live-streamed episodes. 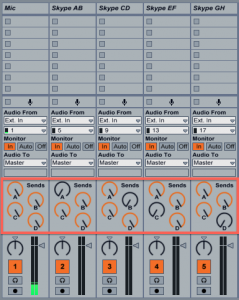 To do so, just add another track (Command+T), turn all itsÂ Send knobs all the way up (unless you don’t want some of your guests to hear these sounds) and drag your audio files into any available slot in the track. You’ll also have to Command-click the little headphone button to be able to listen yourself to what you play in this track. 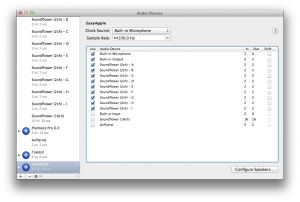 I’ve now updated my package with the latest version of Soundflower (1.6.6b) and edited it slightly asÂ DoctorMikeReddyÂ suggested to restore Soundflowerbed compatibility. This entry was posted in Computer, English and tagged ableton, mac, multi track, os x, podcast, podcasting, record, skype, soundflower, streaming by Luca. Bookmark the permalink. Does each caller on Skype call you on your SINGLE account? 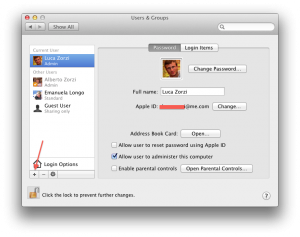 Do you need a separate Skype account for each instance of the app open on each user? You need a separate account for each instance, if you try to login with an account which is already in use you get logged out from the previous instance of Skype. interesting concept. 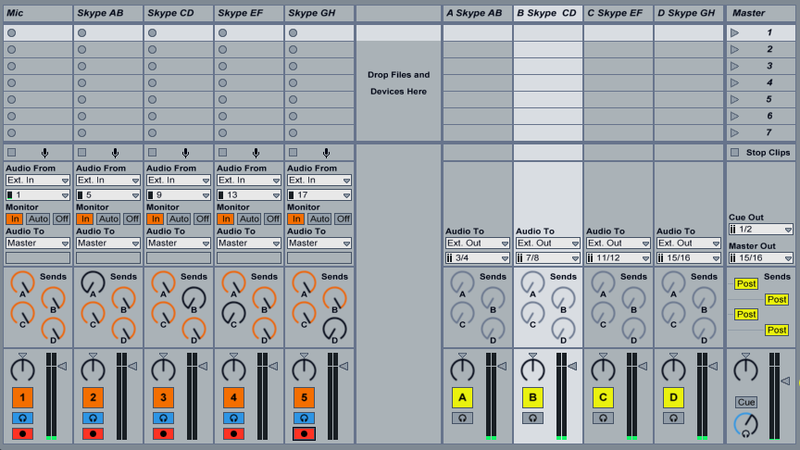 And I think the only one that works with multiple remote speakers to seperate them to different tracks. I know a similar concept with Mumble. Where all remote speakers and all local Mumble instances are in the same room and every local Mumble instance mutes all but one remote speaker different to the other instances. 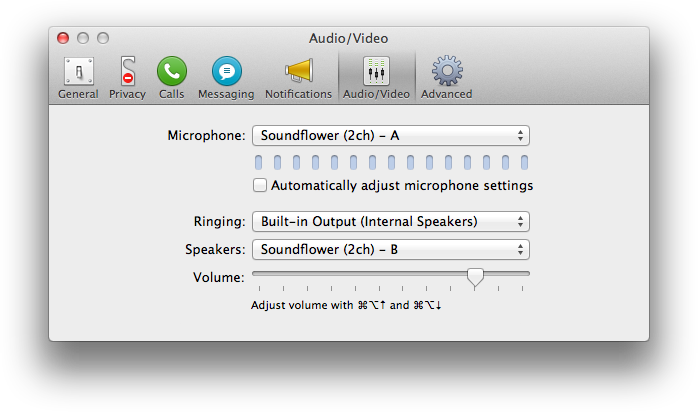 In this scenario I understand how the remote speakers can hear each other, because they are in the same room. In youre concept I understand that each of the local skype instance call one of the remote speakers. I really did not get the point how the remote speakers can hear each other. Maybe you can explain this in the article. Are the B,D,F,H Channels for reflecting the audio from a remote speakers to each other? 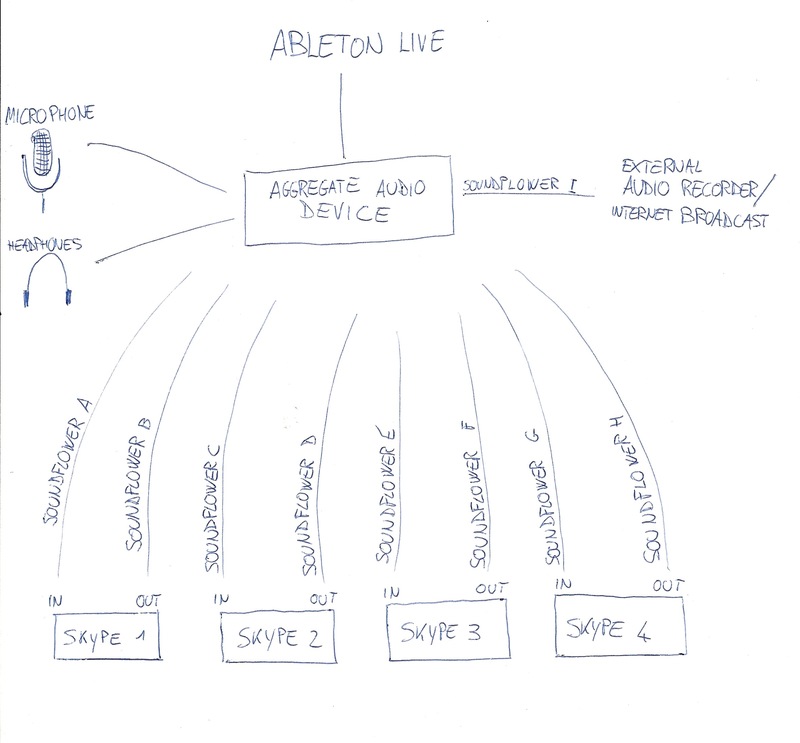 basically here I use Ableton Live as an audio mixer, and specifically I use it to realize the so-called mix-minus: every caller can hear everybody elseâ€™s audio but not his own, in order to avoid annoying echoes. So yes, B,D,F feed audio back to their â€œownersâ€. thanks for the explanation and the scheme. I’m not as technically savy as many people might be..do you have a video explaining the process…I’m a “seer” and reader and it helps to have a visual with all this. Luca- This is really good stuff. I have been trying to get my audio to work in BOINXtv so I could broadcast with multiple channels and I think you nailed it. Thanks for the great insight and the video is very helpful! this is amazing. thanks for documenting it. now on our podcast (ten junk miles) we can skype multiple remote peeps at once! 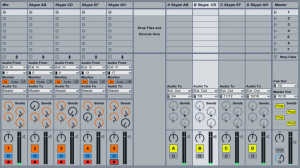 I’ve been banging away at trying to sort this out with all kinds of different combinations of hardware and software, and this – so far, anyway; I haven’t gotten a chance to fully test it yet – seems to be the most streamlined and elegant solution. The real breakthrough for me was running multiple instances of skype – super slick! The only thing that threw me for a bit was the way the Aggregate Device handled routing audio to/from my USB audio interface (which has 2 ins and 2 outs of its own). 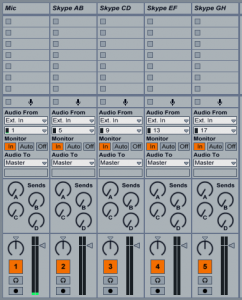 Because they’re not labeled explicitly in Ableton (just the numbered pairs), I had to do some trial and error to get it working.